Passionate about cars and motorsports, Cheryl Tay is a familiar face in prominent local, regional as well as international automotive titles. More of her at www.cheryl-tay.com. She also happens to be a recent gym and fitness convert. Here she meets a female weightlifting buff who is a lot more muscular than your average girl -- or guy, for that matter. I first heard of Melissa Sarah Wee from fellow gym-going friends, who warned me not to train too hard lest I start looking like her. So I checked her out on Instagram and my jaw dropped. 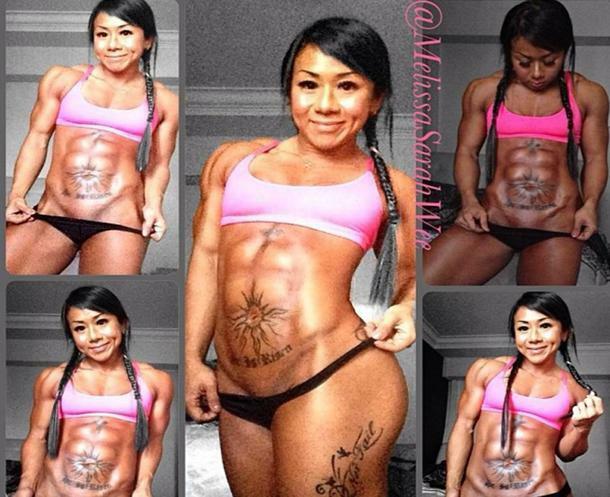 Melissa Sarah Wee is not a bodybuilder but has more muscles than the average girl. Melissa is not a bodybuilder or a fitness trainer by profession, but she has the kind of physique that will put many guys to shame (that is not my goal, by the way). Curious to find out more about her and how much effort it took to get that body, I approached her for an interview, where she chatted freely about her journey. The 29-year-old primary school teacher has come a long way with her body, first succumbing to societal pressures and after a series of painful experiences, finally finding a happy place within herself. Melissa from then to now. Like many girls out there, the problem started when Melissa wanted to lose weight. She was bulimic in her teens, binging then purging her food, to the point where she had to be hospitalised for a week. Her petite 1.56m frame hit an all-time low of 45kg, and she had to seek help from a psychologist and her church counsellor, to get back on track. From there, she slowly became happier and started putting on weight, but overdid it and tipped the scales at 74kg when she turned 18. That made her feel worse all over again but this time, her mother signed her up for a gym membership and Melissa started attending group fitness classes. “I felt very intimidated because I felt so fat and I was totally unfit. Just 20 minutes into the class and I already felt like dying,” she recalled. Melissa then moved on to doing her own research and started training in the gym three times a week, with the aim of getting a flat stomach. 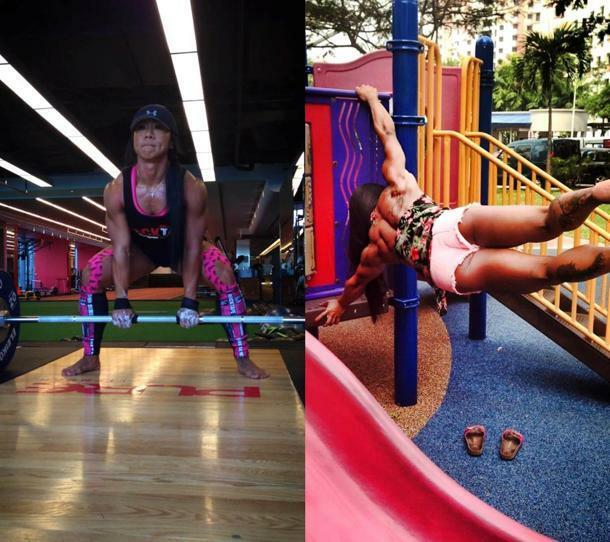 But the more she trained, the more addicted she became and she went on lifting weights until she became a certified trainer and worked in a gym for a while. Four years ago, she became very strict with her diet and started preparing her own meals. She continued lifting weights but began to run a lot of marathons too. At that time, she was studying at the National Institute of Education and would run five times a week at 4am, before hitting the gym at 6am. Clocking over 100km in a week, she eventually hurt her knee from all that running and was out for two months. Melissa then switched her focus to solely weightlifting and came across Dana Linn Bailey, the first in history to attain a "Pro" level for women's physique from the International Federation of BodyBuilders, and decided that she was to be her inspiration. 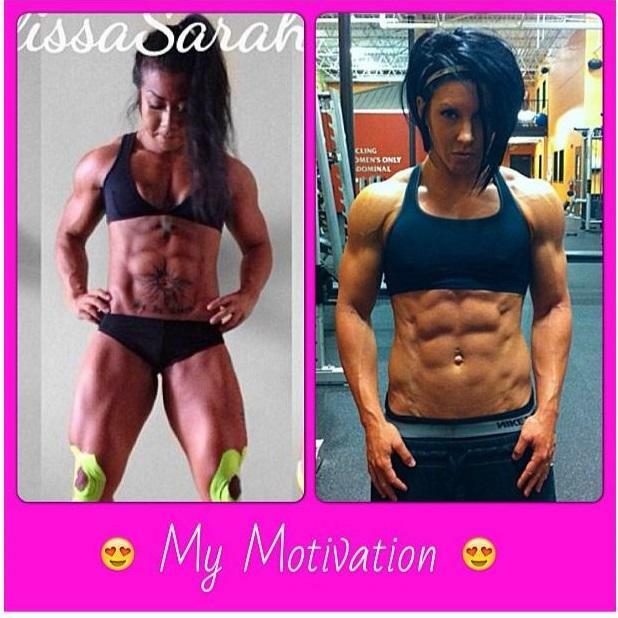 Dana Linn Bailey (right), is Melissa's inspiration. “I really want to be like her! I don’t intend to be a bodybuilder but I do want to retain a certain amount of muscle. It will probably take me another five years to get to where she is now though," said Melissa. Just for the record – Melissa can do a maximum of 315 pounds (about 143kg) for the dead-lift over five reps, and eight reps of 310-pound (about 141kg) squats. Melissa's strength puts many guys to shame. All that discipline and commitment is normal, you think, if she were preparing for competition of some sort. But Melissa’s lifestyle is something she enjoys doing and not for commercial interests. She did take part in a figure competition two years ago though, just for the fun of it, and is considering participating in an overseas one next year. However, there are many unable to accept Melissa’s body and netizens have been unforgiving with their comments. Some even write hate mail to her, telling her she is better off dead or that she’s a transvestite. “I used to be bothered by these comments and criticism, but I’ve since learnt not to care. I am not doing this for anybody," declared Melissa. "My family and friends have been very supportive of me and they don’t mind me having more muscles than the average girl." She also gets annoyed when people tell her to stop putting on muscles because “no men will date her if she gets too big”. You guessed it right – Melissa’s boyfriend is a bodybuilder. A big question on a lot of minds is whether Melissa takes steroids or drugs to attain her body. She says it’s all-natural, but she does take a lot of supplements such as BCAA, aminos, casein, whey protein and glutamine. With a body-fat percentage of less than 10 per cent, Melissa has grown to accept two big changes: being flat-chested and losing her period sometimes. She isn’t worried about not being able to conceive, having seen a doctor about the irregular periods, and in fact wants to have children before she turns 35. Becoming flat-chested was one of the sacrifices Melissa has had to make. It has since been 10 years since Melissa fell prey to societal pressures of being skinny and she is proud of herself for not giving up and sticking to her goal. Now, she trains five to six days a week and follows the cyclical ketogenic diet, where she alternates periods of low carbs, high protein and high fat with periods of high carbs, high protein and low fats. Every four days, she loads up on carbohydrates. Through this journey, Melissa has learnt a lot about discipline and patience. “Fitness is not something where you can see results overnight. I have learnt to wait and just keep doing it... When I first started lifting weights, I kept complaining,” she admitted. Melissa now hopes to inspire others, especially those with eating disorders, to love their bodies and not let society dictate what they should look like.